Sungold – Tomato Town organically grows heirloom tomatoes in the greater Kansas City area as well as Johnson County, Leawood, Lenexa, Olathe, Shawnee, Merriam KS, Independence MO and Kansas City Missouri, KCMO. Varieties include: Cherokee Purple, Brandywine, Stupice, Carbon, Black Krim, Black Cherry, Yellow Pear, Absinthe and Aunt Ruby’s German Green. 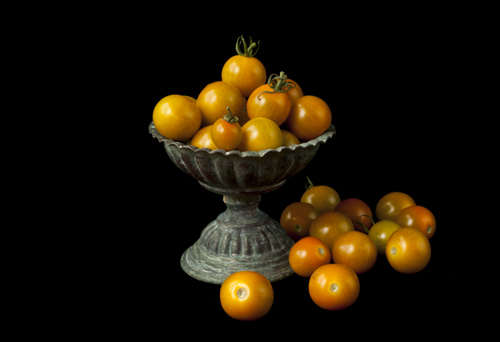 Sungold (or Sun Gold) cherry tomatoes are sweet and delicious. Great to eat right off the vine, excellent in salads and wonderful for snacking. You can’t beat them for their production, either. They were the first ripe tomatoes we had this year, and we can count on harvesting a handful every morning or whenever we walk by the plant. They seem to multiply when you look away. We have four cherry varieties planted: Sungold, Black Cherry, Beam’s Yellow Pear and Tigerella. I’m calling the Tigerella a ‘giant cherry’ as the fruit are slightly larger than a golf ball. We also have a volunteer red cherry plant in our vegetable garden that we found while weeding recently. The sungold variety is popular as it produces well in warm or colder climates. From what I can tell, it is highly disease resistant (like most cherry tomatoes). When they ripen, they turn pale yellow and then a deep orange color – which I only found out recently, as we ate the others way too fast! One site says they are prone to cracking, which we haven’t experienced yet. The indeterminate vine is already six-feet tall, and looks like it will produce copious amounts of fruit for the rest of the season. As for the origin, I’ve seen a few references to it being from England. One quip I read in a gardening book warned against planting cherry tomatoes in the garden, unless you want volunteer plants springing up for years to come. In TomatoTown, we say, bring’em on. We don’t mind volunteer plants. This entry was posted on Monday, July 19th, 2010 at 3:32 pm. It is filed under TomatoTown Favorites, Varieties. You can follow any responses to this entry through the RSS 2.0 feed.